*Possible meanings of "Covfefe": Writing up a bill that has a snowball's chance in hell of passing so we can distract the American people from what we are really up to. "Washington (CNN)The collapse of the Republican bid to repeal and replace Obamacare Monday, alongside chaos brewed by the Russia scandal, has revealed a stunted presidency and a White House struggling to master the levers of power. It also leaves President Donald Trump without a significant legislative triumph to show for his first six months in office. "He was playing with a firetruck and trying on a cowboy hat as the bill was collapsing and he had no clue," a top Republican told CNN's Jeff Zeleny on Tuesday, mocking the "Made In America" week at the White House. Trump was prepared to shoulder no blame for the failure of the bill on Tuesday, and warned he would now simply let Obamacare fail. "We're not going to own it. I'm not going to own it. I can tell you the Republicans are not going to own it. We'll let Obamacare fail and then the Democrats are going to come to us," Trump told reporters at the White House. So far however, there is no sign that the Democrats would take part in any effort that would effectively repeal Obamacare. And it seems just as likely that a crisis in the health care industry, involving Americans losing health insurance, would come back to hurt the party in power, in Congress and the White House -- Republicans. Combined with Trump's historically low approval rating for a President at this stage of his first term, and the constant, corrosive presence of the Russia drama, it adds up to a presidency testing the limits of political viability. 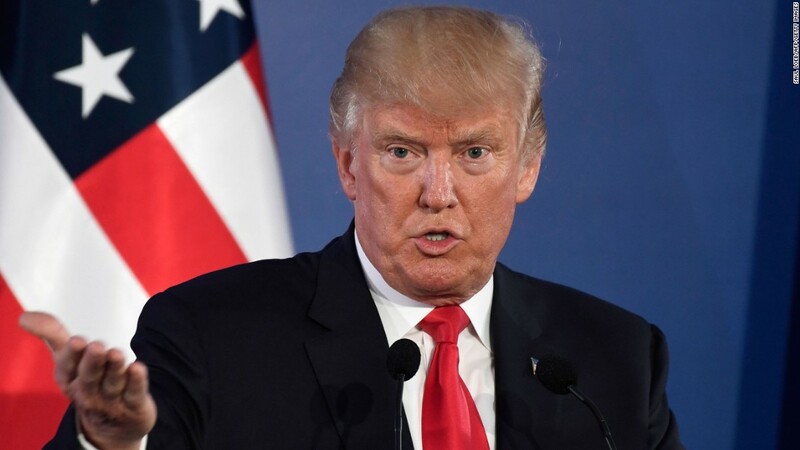 "When a President has the lowest approval ratings of any President after six months it's not surprising he took one of the biggest body blows in politics after six months," said David Gergen, a senior CNN political analyst. "We have never seen a President put forward a major legislative piece in his early days that was greeted with such derision and such fear," Gergen told CNN's Don Lemon on Monday night. The question now is whether the White House and Republicans in Congress can find a way to marshall the GOP monopoly on power towards another significant agenda item -- tax reform for instance. If Trump is to be more successful in future legislative fights, it may require big changes in his style. Perhaps the the ultimate takeaway from this legislative disaster is that Trump's own political methodology -- that was wildly successful in getting him elected, has turned out to be an insufficient base on which to build a functioning presidency. The health care effort revealed a White House that was unskilled in dealing with Congress and in some cases unaware to the political pressures faced by Trump's GOP allies on Capitol Hill. When the bill was speeding towards extinction on Monday, Trump was apparently oblivious to the impending embarrassment. On Monday afternoon, he blithely asserted that all was well, apparently unaware that the bill was already all but doomed. "We're getting it together and it's going to happen," he said during his afternoon event on US manufacturing, where he spent time admiring products including jumping into a fire truck and donning a Stetson hat. He also spent hours this weekend -- when the bill's chances of passing were expiring -- at the US Women's Golf Open, at his Bedminister, New Jersey, course, waving to fans and watching the action. That behavior was in keeping with the hands off attitude that Trump adopted during the Senate's Obamacare repeal efforts. But it also raises questions about his political approach itself. In recent days, Trump adopted big brush themes, maintained his superficial acquaintance with policy, used of social media as a messaging tool, and refused to accept any of the conventions about how politics has been conducted for eons -- i.e. how bills have been passed. He promised vengeance if Republicans did not pass the bill -- but little incentive for doubtful senators to get behind him, perhaps not the most effective strategy for a President with low approval ratings. "I don't even want to talk about it because I think it would be very bad," Trump said in an interview last week with Christian Broadcasting Network. "I will be very angry about it and a lot of people will be very upset. And yet, a pair of conservative senators, Mike Lee of Utah and Jerry Moran of Kansas, broke the news of their opposition -- sinking the bill -- while Trump was dining with other GOP senators to discuss the legislation. "It was beyond rude," a Republican senator who asked to speak without attribution to talk candidly about the feeling inside the caucus told CNN's Dana Bash of Lee and Moran's move. Yet this senator also noted how illustrative it is about the level of respect for this President among many Republicans on the hill. "It just shows what our guys think of Trump. Can you imagine them doing this to another president?" the senator said. The President's public comments before and after the humiliating defeat was typical of his engagement during the process, showing an incomplete understanding of the political dynamics, a tendency to apportion blame to others and a lack of specifics about how the legislation could be saved or improved beyond unspecific platitudes. Then, after disaster struck, he tweeted, calling for a simple vote to repeal Obamacare -- and work on a replacement plan from a clean slate. But it's unclear whether that is a workable legislative solution in the Senate, or a political one for the GOP since it would be easy to opponents to frame the bill as slashing health care for millions of people without offering them any immediate replacement. By Tuesday, Trump was lashing out his political foes. "We were let down by all of the Democrats and a few Republicans. Most Republicans were loyal, terrific & worked really hard. We will return!" Trump tweeted on Tuesday morning. But a rebound will depend on getting a significant piece of legislation passed -- to show this White House and this Congress can get it done despite the obstacles that thwarted the health care push. The immediate impact of the Obamacare repeal failure will be to further overshadow the victories Trump has secured. He managed to install a new Supreme Court justice, Neil Gorsuch, who was widely praised by conservatives and will carry forward his legacy for decades to come. The liberation of the Iraqi city of Mosul, with US help, and the recent strides against ISIS in Syria, have not got the attention they might deserve, and the White House can post to some decent economic data -- though Democrats would say both those trends were set in place by the Obama White House. Quietly, the administration has also been working to dismantle Obama era regulations in the environment, education and financial spheres. But one problem of the Obamacare repeal process was that it was never completely clear what the White House strategy was, other than just waiting pen-in-hand in the Oval Office for a bill to sign. One approach to a successful reform effort would have been to try to mobilize the nation behind the President through visits outside his political comfort zone in areas where he has strong support, and to build momentum for the bill with televised presidential addresses. He chose not to take the path -- possibly because the bill was seen by so many people as an unworkable solution to the problems with Obamacare. The White House put at least a show of presidential zeal over the weekend, revealing that Trump called senators, as he had done on the way home from his trip to Paris last week. But Trump's Twitter account also shows that in the last few days, the President was far more interested in other issues -- including the spectacle of of his trip to France's Bastille Day parade and the fallout from his son Donald Trump Jr.'s meeting with a Russian lawyer. Tuesday morning, Trump again turned to social media to convey his mindset. --Execution Time: 4/20/2019 5:57:23 AM - 4/20/2019 5:57:23 AM = 0.0781245 sec.